On Monday night, I came home from work with some energy. Given that I am currently 38 weeks pregnant, this is a rather rare thing lately. So, I sat down with Not Your Mother's Slow Cooker, and tried to find a recipe to make. See, the night before, we had been gifted with a new slow cooker. We didn't need to be gifted with it--Sara, are you reading this? It appears that our old one had an accident when we left it at Kurt's college reunion, and this was a replacement. Nevertheless, since we had it (however much it was unnecessary to replace it! ), I figured we would take it for a spin. 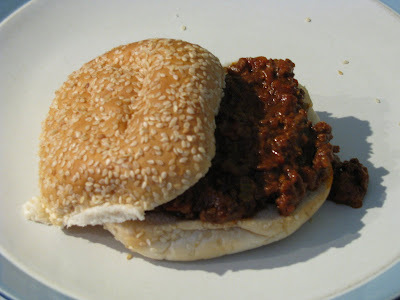 I chose a recipe that was completely out of character for our household--Sloppy Joes. I don't think we have any fundamental issues with Sloppy Joes. It's just one of those recipes that we've never thought of making before. For some reason, on Monday night, they sounded good. So, when Kurt got home from work, we decided on a simple dinner, and went shopping for ingredients for both dinner and the Sloppy Joes, which would cook overnight in the slow cooker and serve as lunches for the next few days. A few notes. Our slow cooker is six quarts. This recipe is built for a "medium" cooker, which, in this book, means 3-to-4 quarts. So, we doubled the recipe to make sure that it would fill the bowl enough not to burn. This turned out to be a very wise choice, as it was still only filled about halfway. It cooked well, though, so I'm thinking the empty half of the crock did no harm. My other note is that, when we make this recipe again, we will use ground turkey instead of ground beef. It's just personal preference. But, in recent years, even the leanest ground beef still tastes greasy to me. I love my ground turkey, so I'll definitely make that substitution next time. The overall reaction was that this is a very good recipe. I love that it doesn't use heavily processed foods. Actually, that is something that I love about the whole book. Most recipes I find for slow cookers are laden with cans of "cream of this soup," and "cream of that," canned vegetables, and other processed foods that I can't see myself using if I were cooking stove-top. This book, in general, avoids that downfall, and this recipe is no exception. I highly recommend the book to health-conscious, but time-pressed people who would like to use their slow cookers to make REAL food. 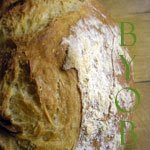 Here is a link I found to the recipe. Enjoy! Hmmm...never thought to make Sloppy Joes in my slow cooker before, what a great idea. Thanks! Oh my gosh just the other day I was thinking of making sloppy joes! Look delicious!